How to choose your Edenly Wedding Rings? Choosing your wedding rings is an almost ceremonial occasion, as these jewels will seal your commitment and accompany you throughout your life. For the woman, this choice is often guided by the model of engagement ring already selected and on which will be superimposed the ring. She will often favour a golden ring of the same colour of gold as that of her engagement ring or her solitaire, and an identical ring width or finer for maximum elegance once worn on the finger. 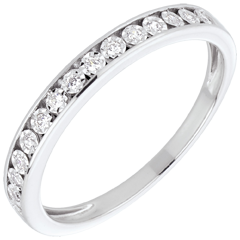 The choice of a gold and diamond ring or diamond-paved ring will often also be conditioned by the already existing engagement ring style. The choice of a ring for the man will be more according to the morphology of the hand, that it is robust or finer. A diversity of colours of yellow gold, white gold or pink gold, will also be added the choice of the type of polishing, for a polished ring or a brushed ring. Another distinguishing feature is the section of the ring, which distinguishes a round marriage ring from a square section ring. Classic or creative, fine or large, in yellow gold, pink, white or several golds, with or without precious stones, you will just have to filter in the search engine, to discover our corresponding models, to refine your criteria, and to add your favourites (heart) to the final choice. 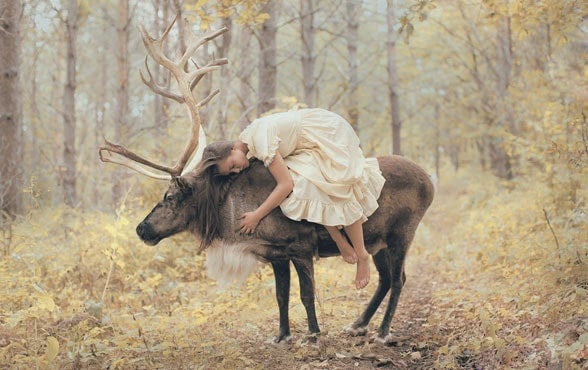 You will be able to free exchange or to make refund for 1 month, if that did not give you whole satisfaction. Why choose Edenly for your wedding bands? Beyond the diversity of models and an irreproachable jeweller know-how, Edenly offers competitive advantages with 20% discount on your second alliance, free engraving, free delivery, 2 years warranty, delivery to size or free exchange, as well as free refund for 1 month. These services and benefits testify to our desire to be a committed and accessible brand, close to its customers and who accompanies you in these great events of life as is marriage. With a collection of more than 30,000 women's and men's rings sold all over Europe and an unsurpassed satisfaction rate, Edenly jewellery has quickly become one of the major players in the wedding world. Recognized as a true expert in the gold ring and wedding rings segment, the brand convinces thousands of new couples each year for their union. Our EXPERTISE is based on work two key criteria: The DIVERSITY of our offer, with an abundance of models, articulated around the three colours of metal: yellow gold, white gold, pink gold; cartage 18 or 9 carats, polished or brushed, and crimped with or without diamonds. ; and the uncontested QUALITY of our jewellery, which testifies to the meticulous know-how and the professionalism of our workshops. For any questions or help in your choice, we are at your disposal. The whole Edenly team congratulates you for this beautiful commitment. 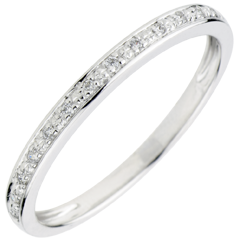 We hope you enjoy browsing our online jewellery website and hope that you will find the Edenly alliance that suits you, the one that reflects your story. It is from the fifteenth century that the difference between engagement rings and wedding rings has been clearly distinguished. An engagement ring must be adorned with a gemstone (most often a diamond), whereas a wedding ring is a much more simple ring. Whether in white gold, yellow gold or pink gold, you will be delighted by our wedding ring designs. If you would like the diamond on your wedding ring to match your engagement ring, there is the choice of a brilliant cut diamond, a princess cut diamond and a cushion cut diamond. They can be alone or in a series, half or fully-fronted. 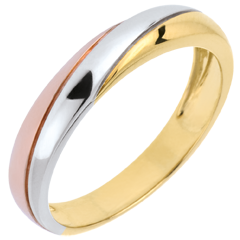 As well as womens gold wedding rings, we also offer gold wedding rings for men. 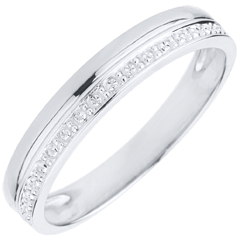 For a man's wedding ring, there is the option of a fully gold ring or a diamond wedding ring. You can choose to have the same design of gold wedding ring. However, if the bride-to-be wants a diamond wedding ring and the groom a gold wedding ring, you can find your preferences in our collection. 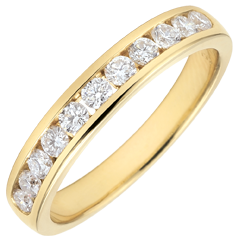 Your gold wedding ring can be personalised with diamond wedding ring engraving. Alternativey.. why not design your own wedding ring. Our interface allows you to generate the ring of your dreams before your very eyes. Discover the bespoke wedding ring creator.